A barber in Moose Jaw is challenging others in the trade to offer free haircuts to homeless people. Jay Gauthier says he gets a sense of worth and gratitude when he is cutting the hair of homeless people, which makes him forget all of his problems. Gauthier was homeless at one point in his life and even spent time in a federal prison for armed robbery. 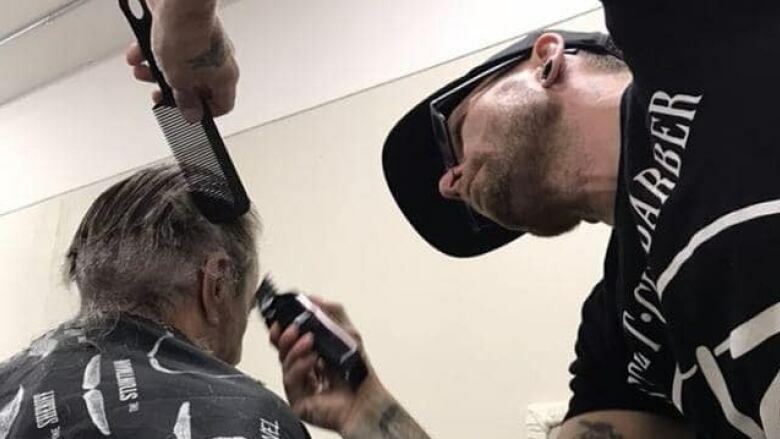 Now, he's a barber and is providing free haircuts to homeless people in Moose Jaw. "That half an hour that I'm with that individual, I feel like I'm doing something for this person that nobody can. I'm providing some hope," Gauthier told CBC Radio's The Morning Edition on Tuesday. Gauthier said he had been through a bad break up in February and didn't know how to handle the situation. He said one of his mentors gave him some helpful advice: "'Go help somebody else out.'" He put up a Facebook post calling for other hair stylists to help provide free haircuts for homeless people. During the first session, he said he spent half the time crying because of the relief it granted him. At the end of July, he moved from Calgary to Moose Jaw where he is now providing the free haircuts at Riverside Mission. The first client there also got a bit of a heavy talk. Gauthier told the person about his past, that he had been homeless and had been in prison, that he had later become a counsellor. "I gave him some really personal stuff, he opened up and then we established trust," he said. "It was great." Now Gauthier is putting out another call for other barbers to do the same. He said barbers work within a "vulnerable space" where they give advice and essentially act as counsellors. Gauthier also wants to remove the stigma surrounding homelessness.